The lack of a good POC test is impairing TB control efforts. A database of TB biomarkers will help accelerate efforts to develop such a tool. Imagine you’ve been feeling severely under the weather for a few weeks; you’ve been coughing a lot and are generally feeling lethargic. You visit a healthcare provider to find out what’s wrong and get some medication that’ll make you feel better. They run some quick tests, but the tests are only able to correctly detect the simplest version of your illness about half the time. There’s a better test, but you didn’t anticipate it being so expensive! And if you want a more definite diagnosis, you’ll have to wait another 6 to 8 weeks. Since you need symptom relief, and you also might never actually receive those test results, you’re given some all-purpose general anti-flu (whatever those are) or anti-malarial pills and told “there you go!” You return home, but after a few days your meds don’t seem to be helping your recovery at all; in fact, your brother and your grandma are both coughing now, too. This is an unfortunately common scenario for TB patients who don’t have access to timely, accurate diagnostic tests. The quick tests that are widely available, i.e. sputum smear microscopy, have poor sensitivity and cannot detect drug resistance. GeneXpert MTB/RIF has good diagnostic ability, but has not yet been implemented in many healthcare systems and/or still requires patients to pay for it out-of-pocket. Bacterial culture, which can identify drug resistance, is the gold standard test, but takes weeks to confirm and patient notification systems are notoriously uncoordinated in many countries. Clearly, there is a need for a TB diagnostic test that is accurate, affordable, and accessible to patients. This is in fact what the WHO’s high-priority target product profiles, or TPPs, specify. Of utmost need is a non-sputum based, point-of-care (POC) test that can correctly inform patients of their TB diagnosis within a couple of hours. A non-DNA biomarker based test is likely going to work best for these specifications. But what even are these TB biomarkers, and how to should we move in that direction? 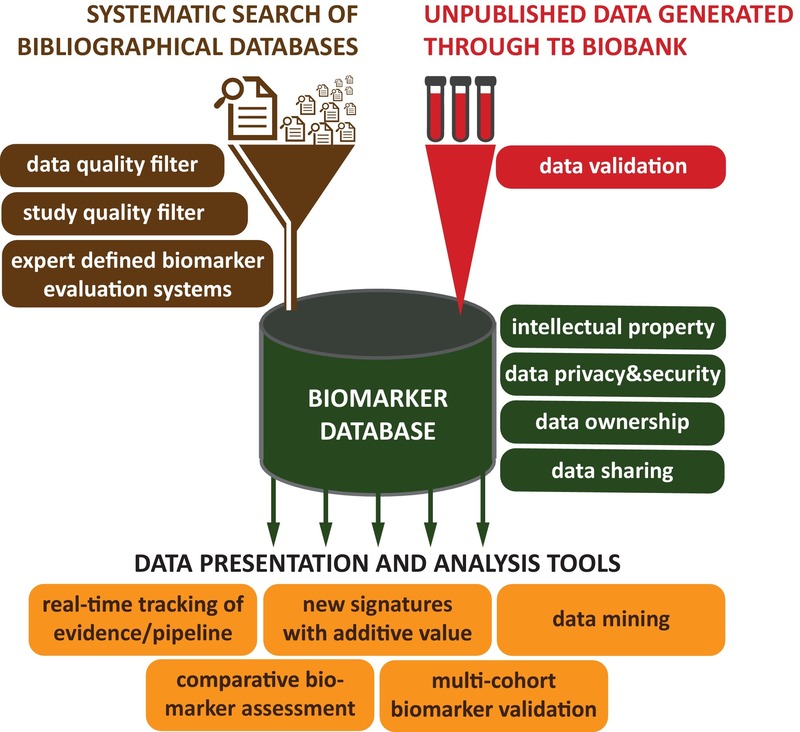 To that end, FIND, in association with the McGill International TB Centre, have been developing a database of biomarkers for TB diagnosis, Bm2Dx. The goal is to compile and present available research in a manner that will assist diagnostics developers and basic science researchers understand which biomarkers have already been examined, their diagnostic performances, and the quality of this evidence. Ultimately, it is hoped that this will help propel TB biomarker research forward through the pipeline, eventually producing a desperately needed new POC tool. Besides centralizing TB biomarker knowledge, Bm2Dx will be linked to FIND’s repository of well-characterised patient samples. This one-stop-shop approach will be especially helpful for validation studies, as putative biomarkers can be assayed on samples from different geographic locations and patient subgroups. A large portion of the TB biomarkers literature consists of biomarkers that have already been tested; nonblinded case-control studies are common and follow-up validation studies are rare. With access to the database of existing evidence and patient samples, this kind of repetitive, preliminary-only work can be easily avoided, which will mean more time spent on researching promising diagnostic candidates. A database is not a complex idea, but we believe that having all the information in one centralized location with links to obtaining patient samples is going to help researchers really build on existing work, instead of ‘re-discovering’ biomarkers that have already been assayed. We anticipate that comparing the existing biomarkers and their evidence will encourage the creation of multi-marker signatures, which will likely be necessary for a POC test that performs well across a spectrum of patients. If we hope to End TB, proper diagnosis must be part of the picture. Compiling existing TB biomarkers research in an interactive and user-friendly way should help us move toward the creation of a true POC test. The database is currently in development, and is seeking beta testers! If you’re at all interested in TB diagnostics, consider inquiring here.